Although I have 20 grandchildren, only one lives close to me and she is the youngest at 3 1/2 years old. Needless to say, I spoil her! I am so happy that I was able to share her first trick or treat adventure two years ago. 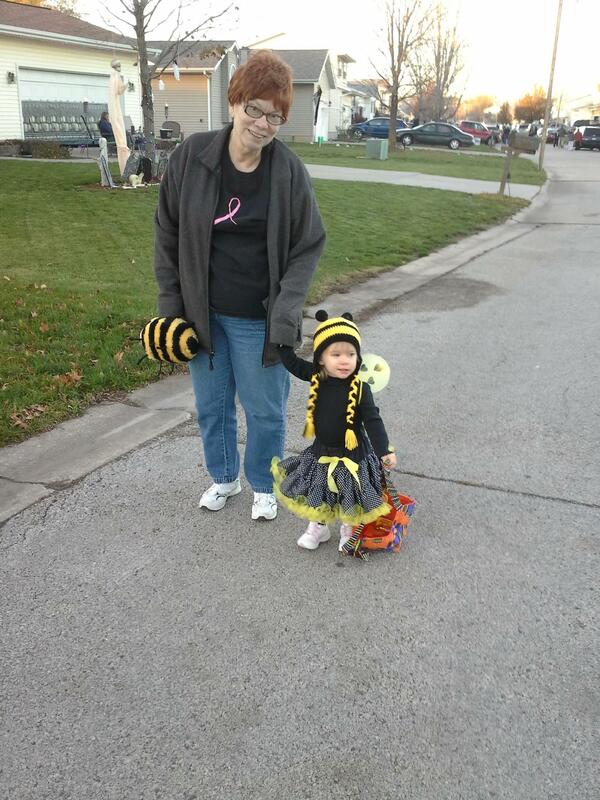 Dressed as a little bumblebee, we started off with her carrying a small stuffed bumblebee while I carried a plastic pumpkin for her treats. As we approached the first house you could see she was not sure what was actually going on. Her mother and I encouraged her to say “trick or treat” to the young woman who answered the door. As we started to walk back down the driveway, she suddenly stopped. First she looked at me – then at the pumpkin in my hand – down at the bumblebee in her hand – back to the pumpkin which now held candy. She held out the bumblebee in her hand to me and reached for the pumpkin. Clearly she had decided holding the plastic pumpkin was a much better deal than holding the bumblebee! 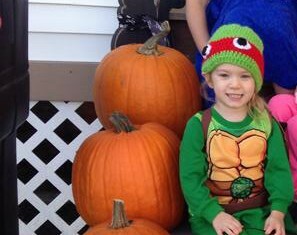 This year she is a Ninja turtle – and growing up so fast! I know there will be many more Halloween evenings and many more costumes. But I will ALWAYS treasure that first Halloween and I am so thankful I have those memories! This entry was posted in Family Life, Joys of Grandparenting and tagged Grandchildren, Grandparents, Halloween, Holidays, Trick or Treat by Barbara Lane. Bookmark the permalink.